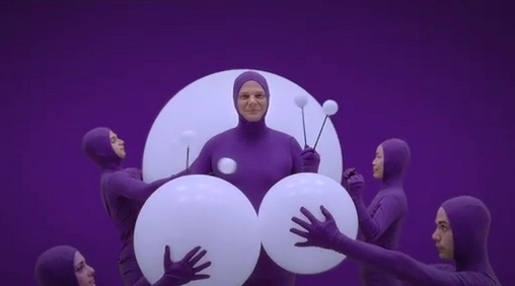 Cadbury in Australia is promoting the new light and bubbly format found in Cadbury Dairy Milk chocolate Bubbly, with a television commercial featuring dancers in purple leotards playing with white bouncy balls in an exercise of symmetry. The spot begins with a purple background and purple clad players, a visual clue for making sense of what is to come. Balloon drummers and dancers play with an increasing number of white bouncy balls, accompanied by “99 Luftballons”, originally sung by German singer Nena in 1984 and recorded in English as 99 Red Balloons. The Bubbly campaign was developed at Publicis Mojo Melbourne by creative director/art director/copywriter Leon Wilson, art director/copywriter Michelle Withers, head of broadcast Corey Esse and agency producer Tuesday Picken. Filming was shot by director Clemens Habicht via Collider, Sydney, with executive producer Sam Zalaiskains, producer Michelle Sahayan and director of photography David Burr. Music was licensed through Level Two Music and produced at Electric Dreams.